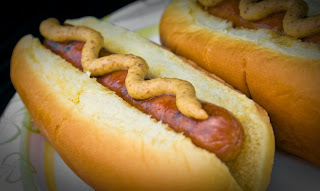 It wasn't actually this hot dog. But you get the idea. It was noon, and I was at a festival of sorts, and the hot dogs had perfect grill lines and they were offering stone-ground mustard, and no food politics, no knowledge of factory farming, food safety (or lack thereof), or the ethics of meat eating could stop me from buying and chowing that $2 all-beef Polish sausage. It's amazing how much community pressure can change the way you feel (and, in most cases, act) when it comes to food. The word around here is almost always POTLUCK, and at said potlucks, there are generally not too many hot dogs to be found. More likely, you'll come up on a big bowl of quinoa tossed with cucumbers, or marinated tofu, or brown rice with carrots and onions, or a big batch of stir-fried kale. I'm baking my own bread and making my own granola and yogurt. For the first time in my life, I know exactly what it is I'm eating pretty much all of the time and it feels natural and easy because I'm living on a farm and getting most of my food here, and I'm around a lot of people who live on farms and also care a lot about good, whole, real foods. I've listened to a lot of talks like this one and read a lot of books like this one and this one that lay out logically the many reasons -- nutritional, environmental, ethical, aesthetic -- to eat more greens and to eat more simply, more locally, more seasonally and I've changed my habits some, but coming here has changed my habits dramatically. I still ate that delicious hot dog, but I felt like a sneak and a rebel. The same way I feel when I bring home non-organic butter from Marketplace. Probably America could use a little more of that kind of healthy guilt for all our own goods. * Delicious, juicy hot dog photo courtesy of "Mike Johnson - TheBusyBrain.com"
Nothing on earth will make me feel guilty for eating any hot dog or sausage. Unless the sausage was made of, like...blind orphans. Classic! I knew what it was before I even clicked on the link. More topical than ever in these hard economic times...?? ?